Home Blog Hurry! Sale Ends Soon!! Our January sale has been the post-Christmas gift that’s kept on giving for you Halloween fans! It’s been a fantastic sale season, and if you haven’t been lucky enough to grab a bargain yet in time for Halloween 2018, why not head over to our Halloween Horror Shop website today and check out these amazing deals for yourself?! But you’ve got to be quick - there’s only a few days of our massive sale left! Sale must end this Wednesday 31st January! Perhaps your lights packed in this Halloween? Or maybe you’re looking to up your game and add something extra spooky to your displays this year? If that’s the case, now is the perfect time to treat yourself to some brand new décor, and save some pennies too! 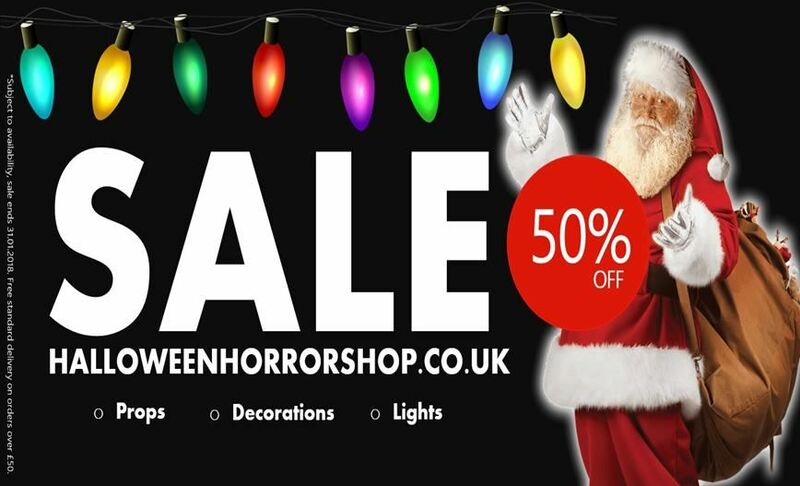 Head over to our Halloween Horror Shop site to find an amazing 50% discount on all our Inflatables, Props, Decorations, Lights and Fancy Dress! If January isn’t the right time for you to stock up on your festive goodies, don’t worry, our Halloween Horror Shop website is well stocked and open all year round!